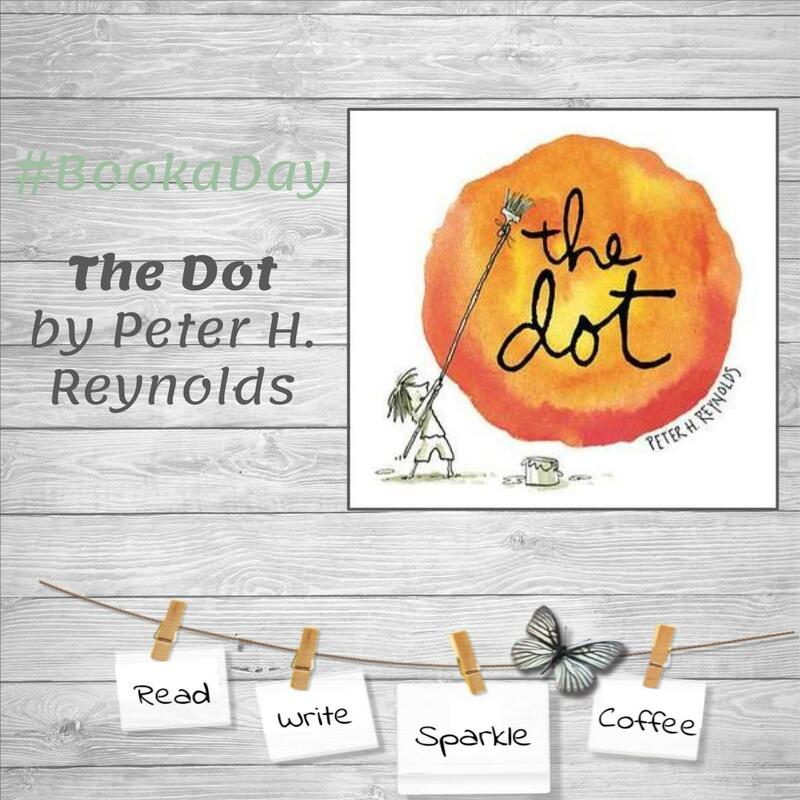 What an incredible story to share with your students when maybe times are getting difficult in writing or in genius hour. They seem to have lost focus, become frustrated with how things are going. 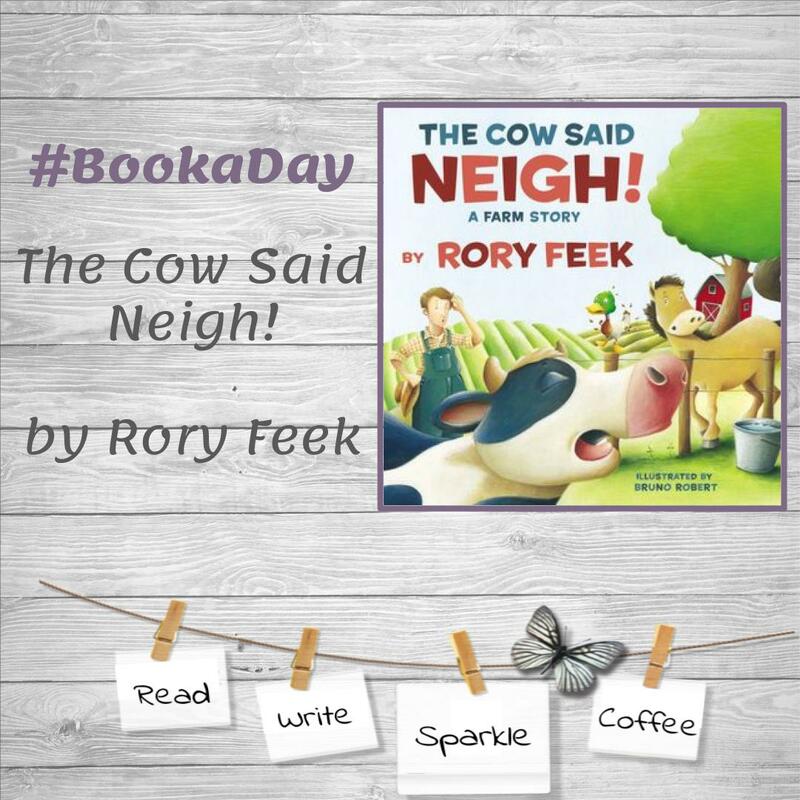 In reading this book, they may be inspired to take a second, fifth, or fourteenth look at their issue and may be motivated to complete it! I have a rating system I use for those books I have read and reviewed on my blog, you may check it out here. 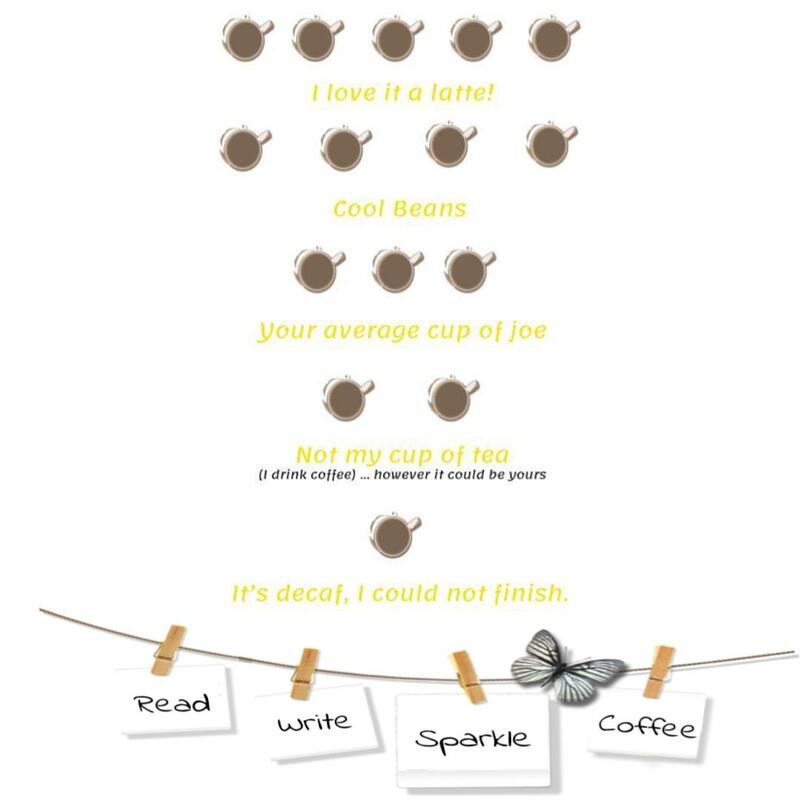 I have given this book five coffee cups, I love this book a latte! 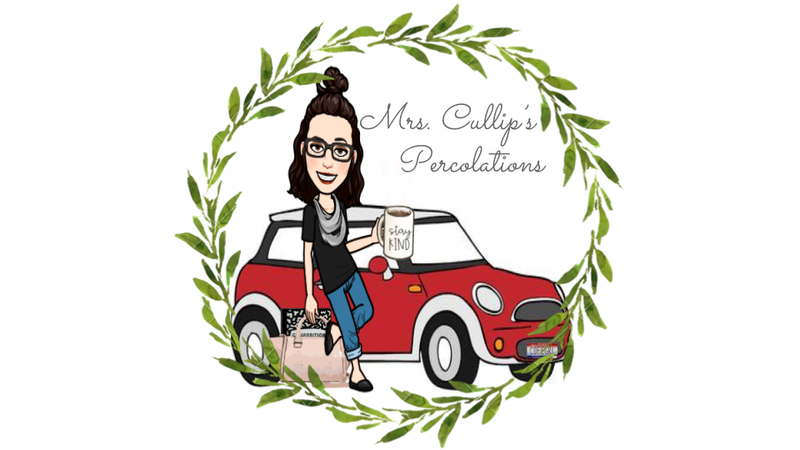 From the Publisher: Be curious! Be imaginative! Be determined! Develop your talents by drawing inspiration from the greatest of geniuses. In a world that changes quickly, the future belongs to those who have an open, flexible mind: like John Lennon, they will imagine the impossible; like Walt Disney, they will work as a team; and like Copernicus, they will be able to think backwards! If you’re worried you might not be up to the job, have no fear! This fascinating book will show you the way. 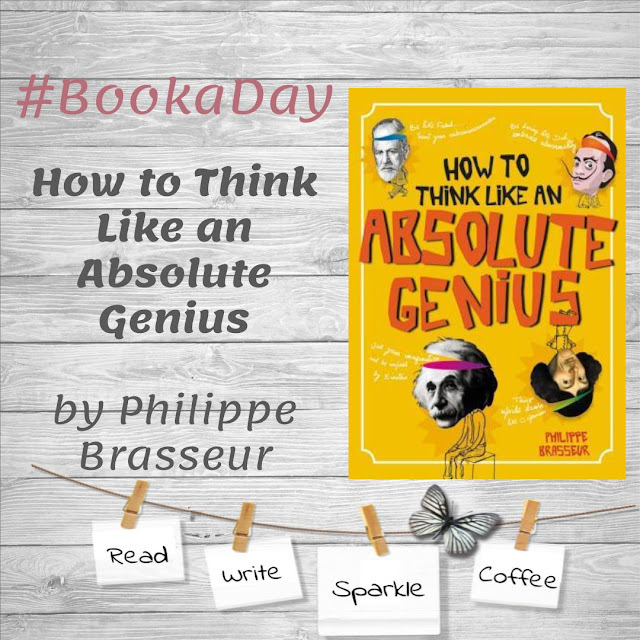 In How to Think Like an Absolutely Awesome Genius, 27 geniuses from different eras and disciplines – artists, scientists, thinkers or writers – entrust you with their "creative methods". Packed with facts, games and activity ideas to boost your intelligence, with this book to guide you, you can become absolutely awesome at whatever you put your mind to. Well organized and beautiful illustrations make this book a must have for any upper elementary classroom. Motivate your students to find their inner genius by discovering habits that made these 27 genius' great! This would be an incredible weekly reading (one a week). That way they can learn a new skill, practice with an activity, and then use it throughout the week. 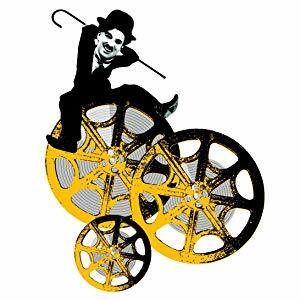 For example: Read about Charlie Chaplin (1889-1977) and how you can see things differently. Then, as a class complete the activity Ways Of Looking At An Image. Throughout the week provide different opportunities to "see things differently" in the various lessons you complete. What a fun way to use a non-fiction book! Have you done anything similar in your classroom? Please let me know in the comments below. From the publisher: Find out about every dinosaur that’s ever been discovered in this Dictionary of Dinosaurs! From Aardonyx to Zuniceratops, read about when they lived, where they lived, what they ate and much more. Featuring epic artwork from Dieter Braun, and up-to-date facts from top dinosaur experts. Includes the world's best loved dinosaurs such as Diplodocus, T-rex, Triceratops,Velociraptor, Stegosaurus and Brachiosaurus. 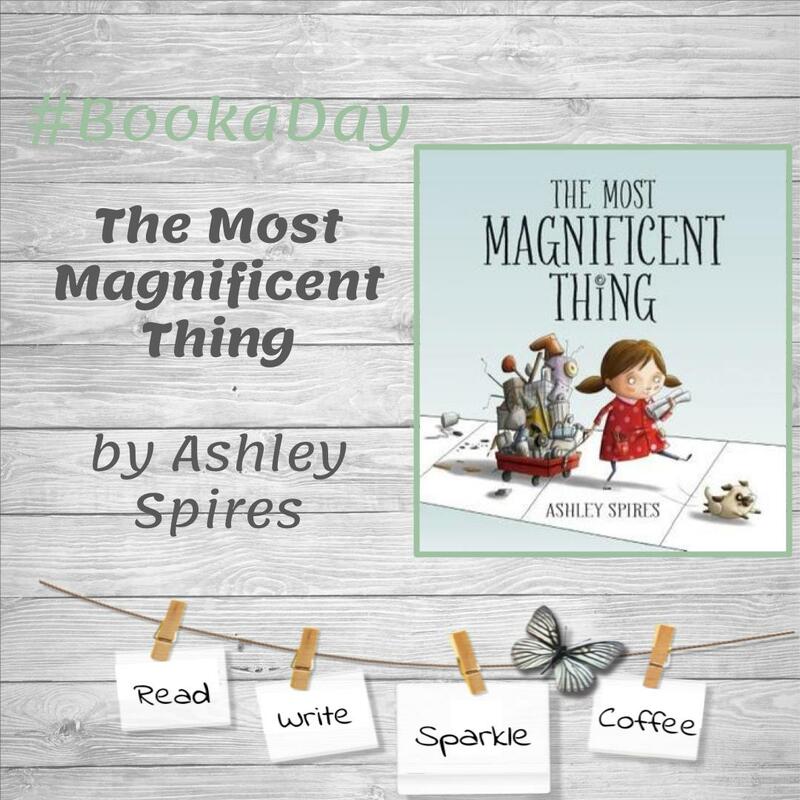 I enjoyed my review of this book and believe it to be an incredible resource to the upper elementary classroom. 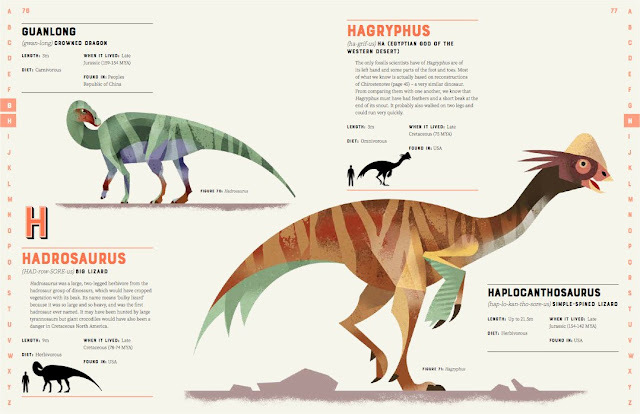 Each dinosaur listing in the dictionary provides a beautiful illustration, facts, pronunciation guide (very helpful!) meaning of the dinosaurs name in English (dinosaur names are in Latin), and when they were living on this earth, where they lived, and how big they are. 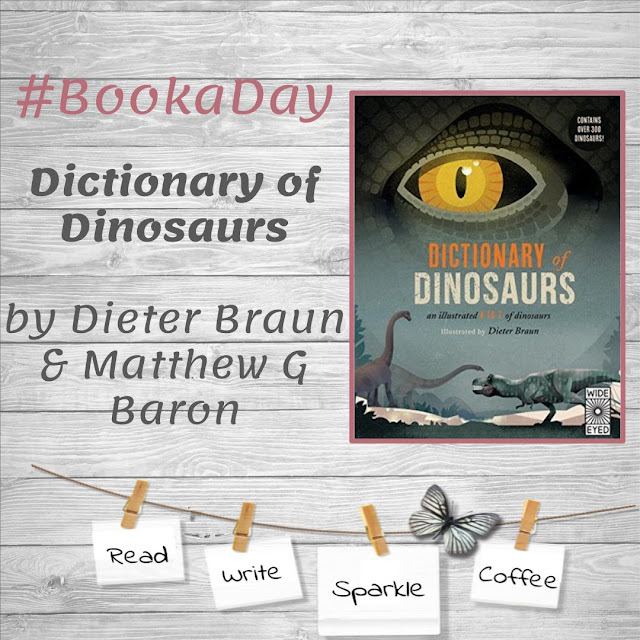 This book could be used in a geography lesson, that students could map out the dinosaurs around the world or it could be used in a math lesson to measure out how big the dinosaurs were (and then compare). 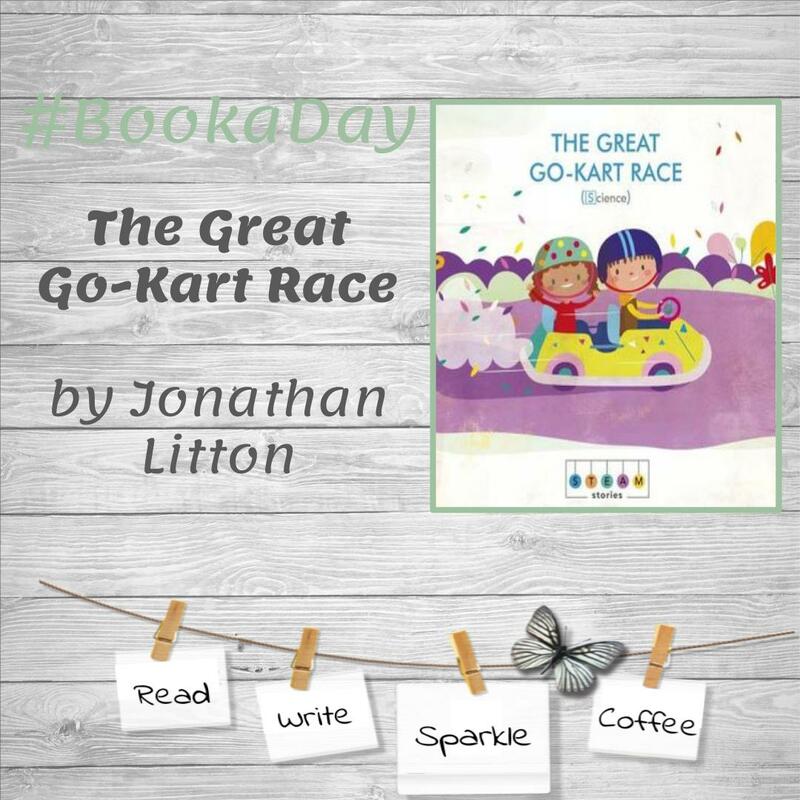 From the publisher, Max and Suzy are entered in the Great Go-kart Race, and all is going well until… they get stuck in the mud! This is the first of several obstacles they must overcome en route and they find that science holds all the answers! Will the dynamic duo find the solutions to all the problems and win the race? I love books that point out there is science, technology, engineering,art, and math everywhere! In The Great Go-Kart Race we find science in how we solve problems with: being stuck in the mud, using objects in motion pushing and pulling forces; headlight that would not work, using energy sources, electricity, and power; and another, which science method can you use to solve this one? The book concludes with a resource section that helps readers with what science methods you can use to help solve the problem. In addition, there are activities students can complete to use this method too! I am looking forward to reading more the STEAM Stories series. 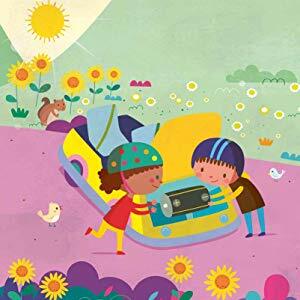 STEAM Stories is a series of interactive picture books, each introducing a different STEAM topic: Science, Technology, Engineering, Art, and Math. 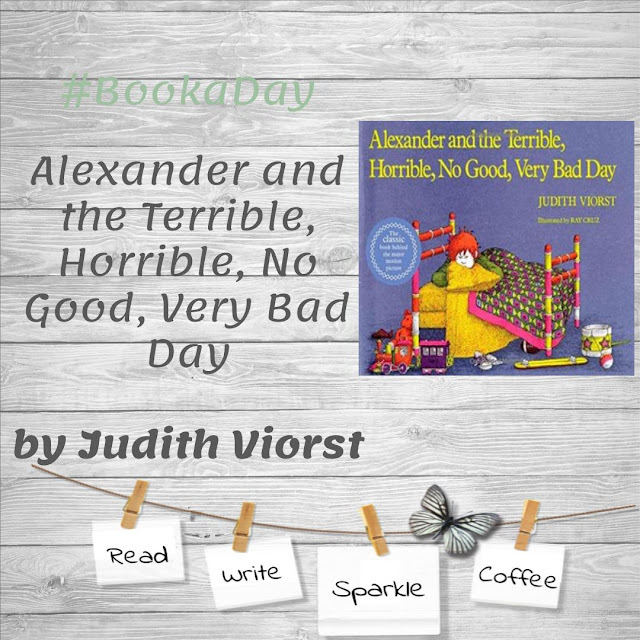 Join dynamic duo Max and Suzy in these action-packed problem-solving adventures. Each story introduces one of the STEAM topics so children will be introduced to key concepts while enjoying a gripping story. I am trying out a rating system for my blog! I give this book four coffee cups, Cool Beans. My daughter and I have finally finished this phenomenal story of Christopher Robin and his friends in the Hundred Acre Wood. This summer, we went to the showing of Christopher Robin, opening night! 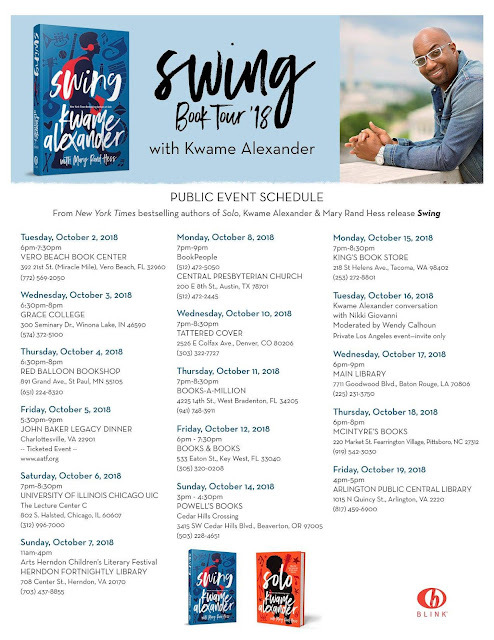 I loved it, so I was ecstatic to see the book the following day at Barnes & Noble.. knowing we were in for a treat since the book is always better. And it was!!!! Each night that my daughter and I read through a chapter, we laughed, we cried, we attempted to make our best donkey voice, and related this book to shows of Winnie the Pooh that we have seen before. The last thing was mostly me, I have watched all of the movies hundreds of times. My oldest son, Venti Espresso, he was born in 2000 when all of the baby stuff was Pooh Bear, I swear I should have named him Christopher Robin. This would have been perfect, since his favorite stuffed animal was Pooh (he still has it). So this story of Christopher Robin is just amazing. 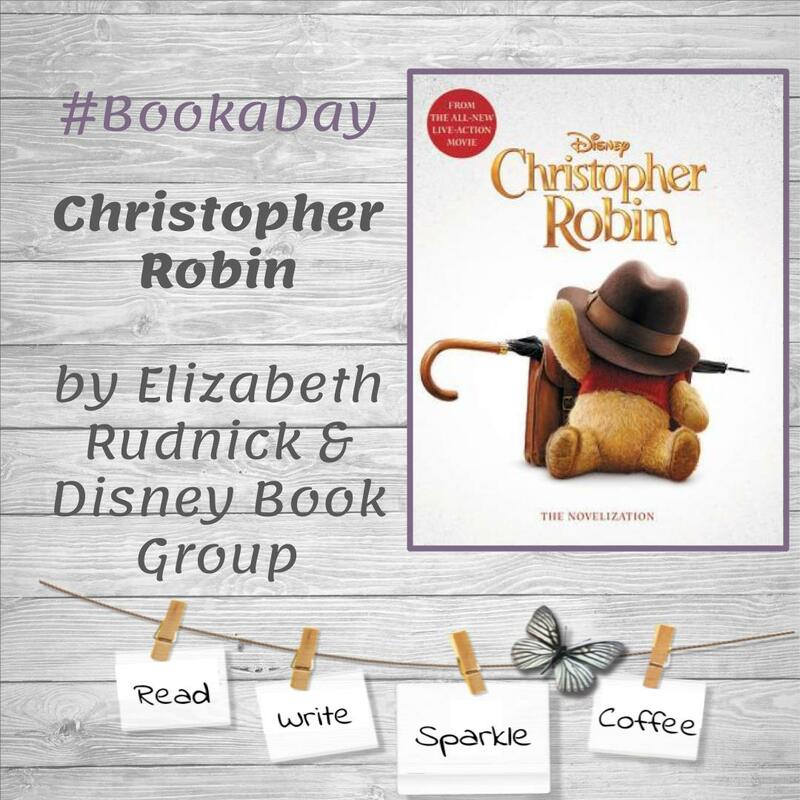 Christopher Robin is all grown up and has forgotten about his special times at the Hundred Acre Woods, until one day Pooh meets him in London. It seems as though Pooh has lost all of his friends and believes that his good old friend Christopher Robin can help him out. He was right, Christopher is able to assist him in his "expotition", while at the Hundred Acre Woods which is depressingly different due to the lack of sunshine and thick fog, Pooh begins to understand that his friend is also in need of some assistance. With the little help of all of his friends and some new ones, he sets out on another adventure. I will admit, there were times, I held back tears as I read. Whether it was the storyline or me reliving my childhood during moments of Christopher Robin reliving his, it was an emotional "expotition". I encourage you, to go on it.. and bring a few friends along, whether it be your family or your classroom. 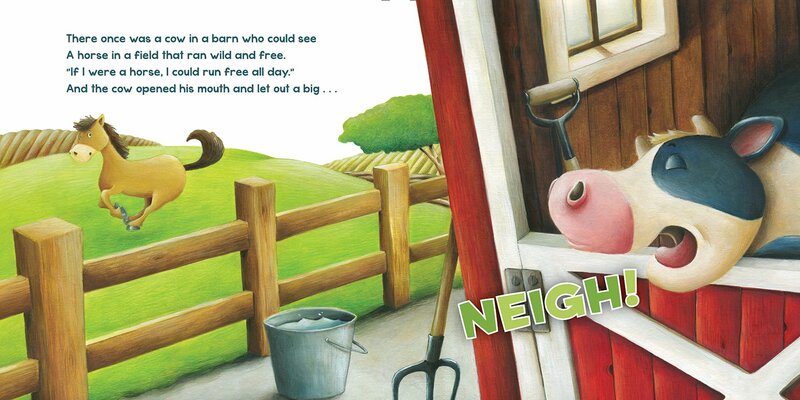 This would be a great read aloud, or even a fun readers theater! Last week was midterms at Idaho State University, I missed reading and sharing my picture books as I was drowning in essays and exams. Today, I am still writing an essay; however, have a moment to catch my breath and share with you a book I picked up at the library to assist me with my religion lesson for my Teaching History Methods class. 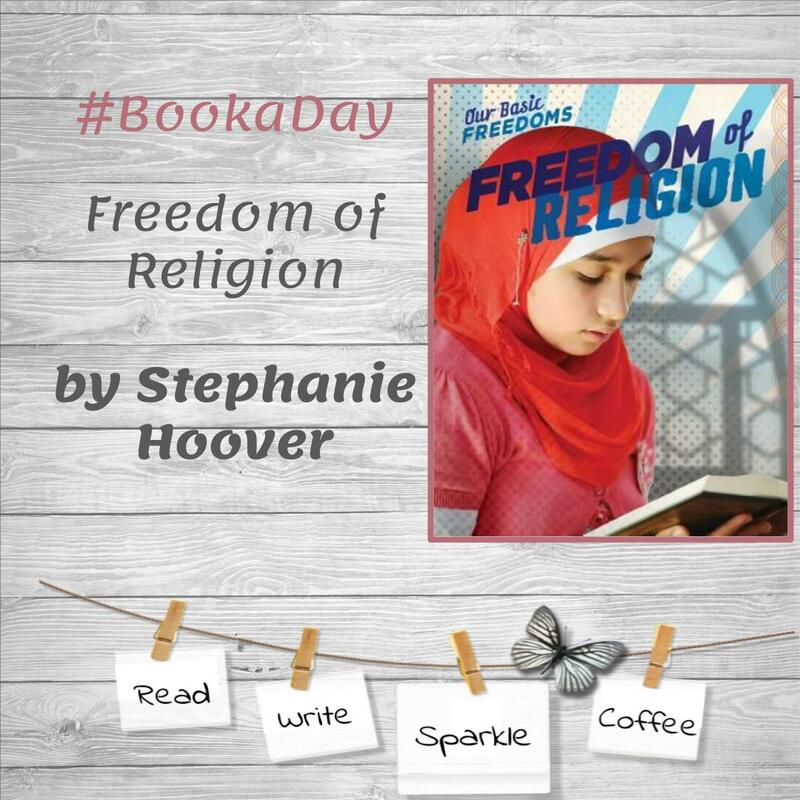 Our Basic Freedoms: Freedom of Religion is a non-fiction informative picture book written by Stephanie Hoover. This is a difficult topic to cover and I believe the author does an effective job at relaying the facts without bias. In addition, it is written with simple and clear descriptions for all readers to understand. 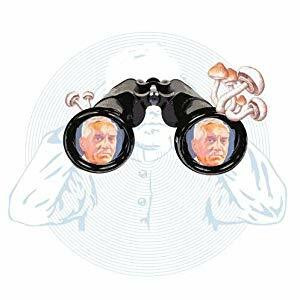 I also liked that the book began with a table of contents to help readers with the organization and layout of the book; Origin of the Bill of Rights, Struggles with Religious Freedom, Religion and Government, Religion and the Workplace, Religion and Schools, and Religion and Daily Life. The book concludes with a glossary and further information section for additional learning opportunities. My focus for the lesson is on the First Amendment, so the first chapter provided me with most of the information I needed; however as I read the entire book I found this to be a great resource book to have in the classroom library. I will also be bringing it with me as I teach my mini-lesson to help me with any specific questions those may have about the legalities of religion and the first amendment. In addition to this book, I have found a handout on the website Teaching Tolerance entitled The Seven Principles for Inclusive Education, a guideline for approaching this topic in the classroom. 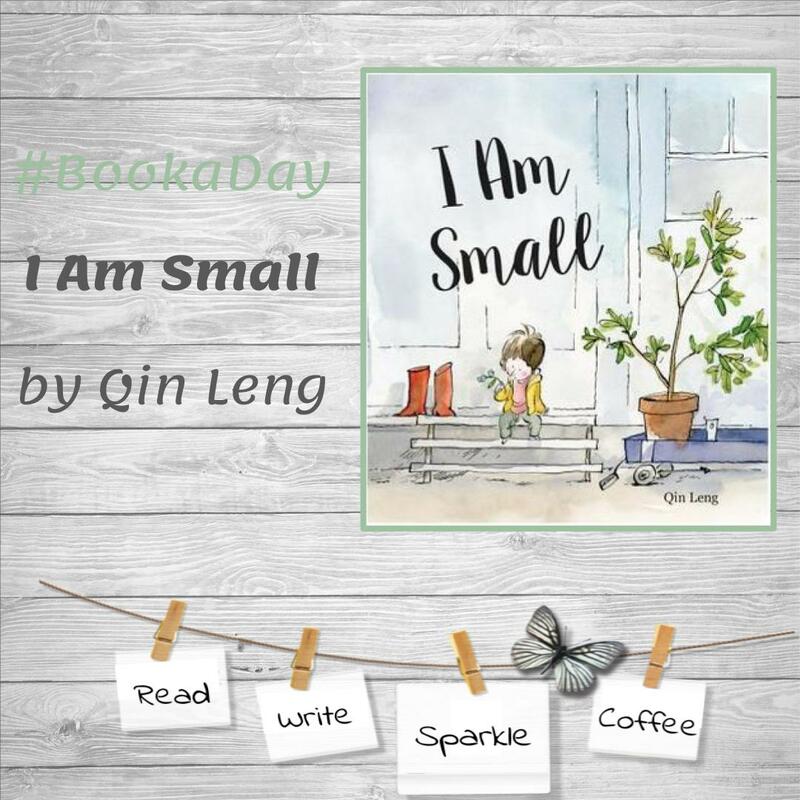 Qin Leng, writes I am Small. A picture book about a little girl who is short in height and does not find it to be very beneficial. This is an incredible story about perspectives. 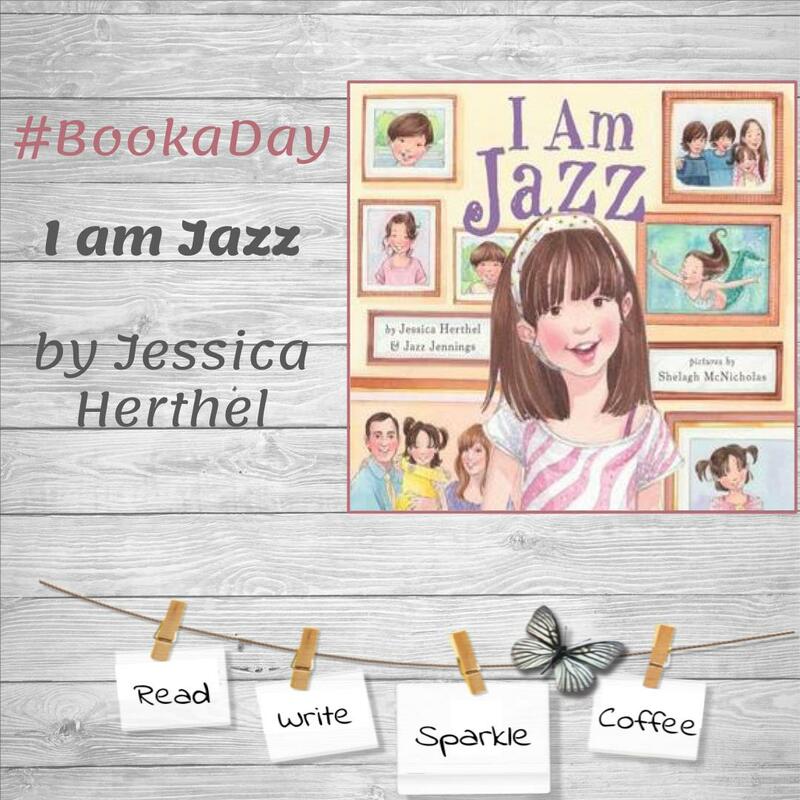 Within the book you find the perspective of Mimi, her friends at school, and then through the eyes of her mom when she presents a special surprise. I love how this book can be relatable to a lot of kids who wish to be a little bit taller or unable to wait until they are older. 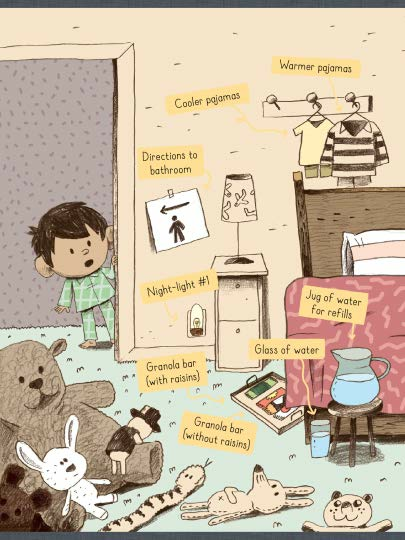 From the publisher: Mimi is so little, “I might as well be called Mini,” she says. Everyone is taller than her, even the family dog! She can barely reach the bottom of the blackboard at school and isn't tall enough to see all the pretty cakes in the display case at the bakery. Though her friends try to tell her there are lots of advantages to being her size --- like fitting into the best hiding places and easily scooting to the front of the cafeteria line --- to Mimi, being small is the worst. But then one day, she hears that there's a surprise waiting for her at home. A very little surprise. And Mimi is about to discover a little something about being little. In her authorial debut, award-winning illustrator Qin Leng has crafted a delightful picture book with a fresh twist on the themes of self-acceptance, growing up, and the arrival of a new sibling. 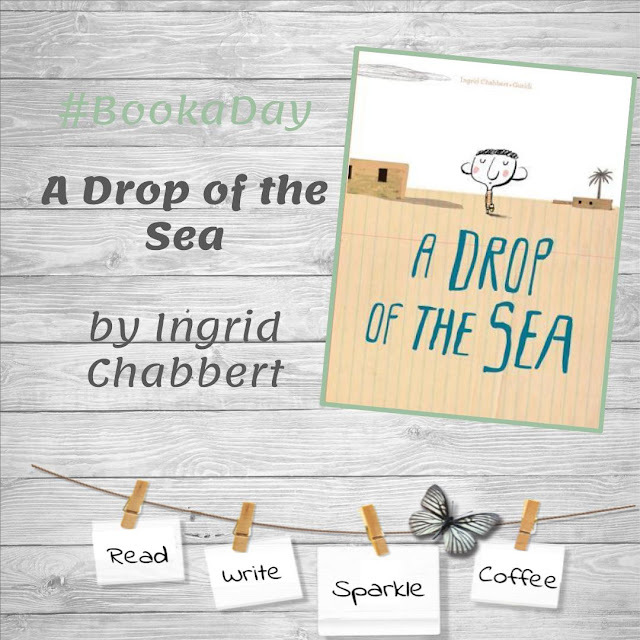 Youngest siblings and small children everywhere will find a kindred spirit in Mimi and will appreciate her change in perspective when --- for the first time --- she sees herself through the eyes of someone smaller than her. Qin Leng's simple but poignant illustrations use gentle humor to highlight how Mimi fits in her world. This is a terrific book for sparking conversations about personal development and self-esteem. It also aligns with character education lessons on self-respect and resilience. 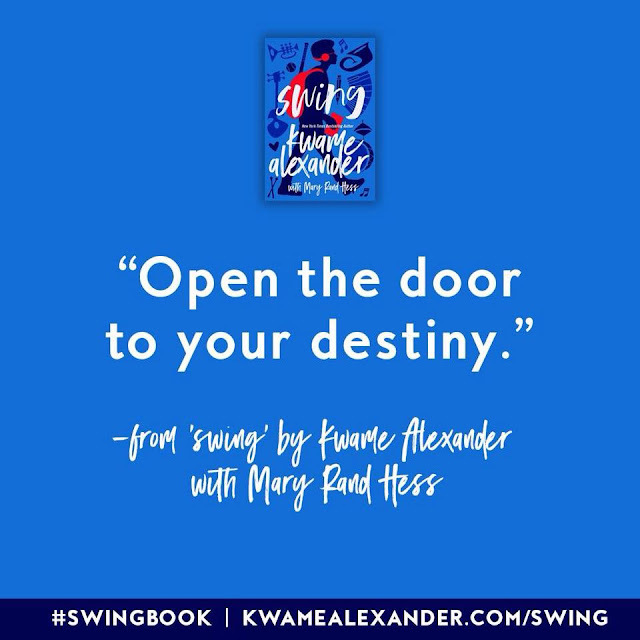 This summer, I was blessed with the opportunity to be on the launch team for the book, Swing. 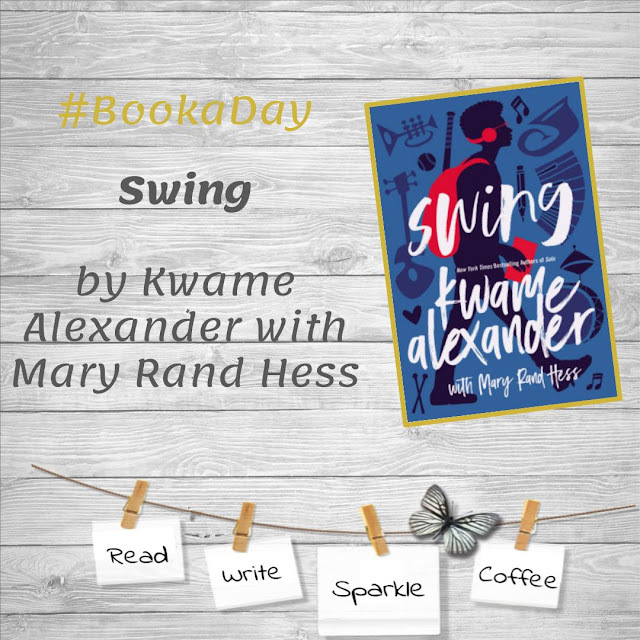 Since then, I have been able to be absorbed in and discuss it with Kwame Alexander and the rest of the launch team via social media. Now, that October 2nd has finally arrived. 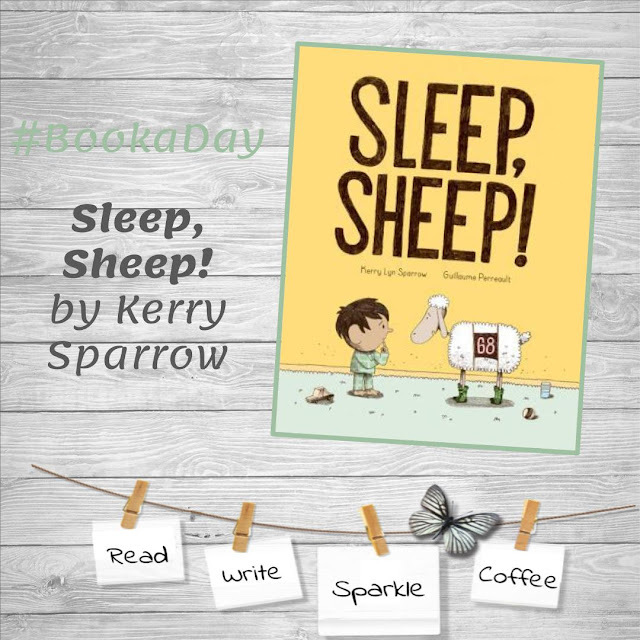 I am thrilled to be able to share this book with you! Themes blended through lyrical anecdotes reminding me of past & present days. Words written in a variety of ways to capture my attention. Feelings stirred within my soul as I experienced each and every page. Now, I invite you to take on your own personal journey through this book! 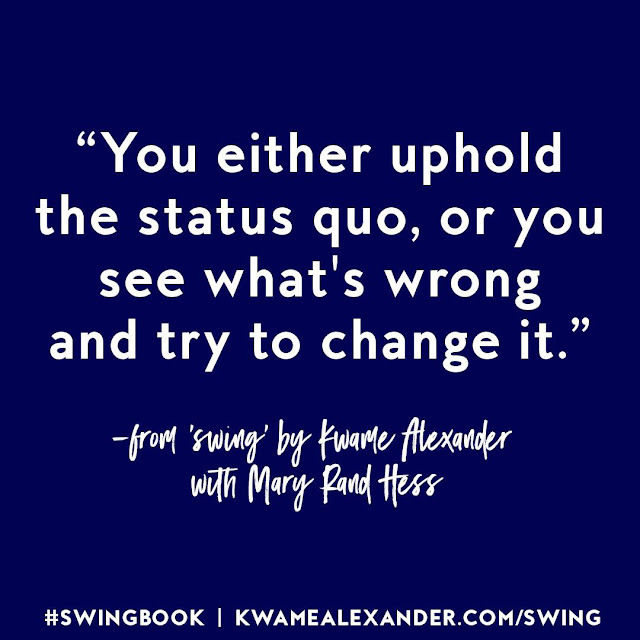 If you loved Solo, The Crossover, Booked, or Rebound I am sure you will endear Swing. From the publisher: When America is not so beautiful, or right, or just, it can be hard to know what to do. Best friends Walt and Noah decide to use their voices to grow more good in the world, but first they’ve got to find cool. Walt is convinced junior year is their year, and he has a plan to help them woo the girls of their dreams and become amazing athletes. Never mind that he and Noah failed to make the high school baseball team yet again, and Noah’s love interest since third grade, Sam, has him firmly in the friend zone. 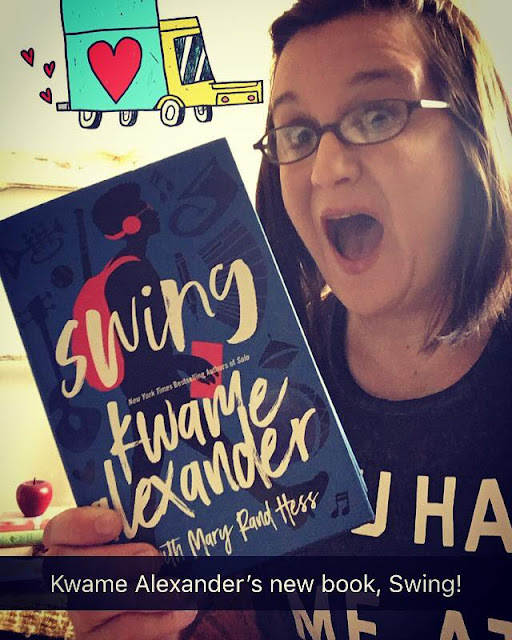 Noah soon finds himself navigating the worlds of jazz, batting cages, the strange advice of Walt’s Dairy Queen-employed cousin, as well as Walt’s own perceptions of what is actually cool. Status quo seems inevitable until Noah stumbles on a stash of old love letters. Each page contains the words he’s always wanted to say to Sam, and he begins secretly creating artwork using the lines that speak his heart. But when his private artwork becomes public, Noah has a decision to make: continue his life in the dugout and possibly lose the girl forever, or take a swing and make his voice heard? At the same time, numerous American flags are being left around town. While some think it’s a harmless prank and others see it as a form of peaceful protest, Noah can’t shake the feeling something bigger is happening to his community. Especially after he witnesses events that hint divides and prejudices run deeper than he realized. As the personal and social tensions increase around them, Noah and Walt must decide what is really true when it comes to love, friendship, sacrifice, and fate. 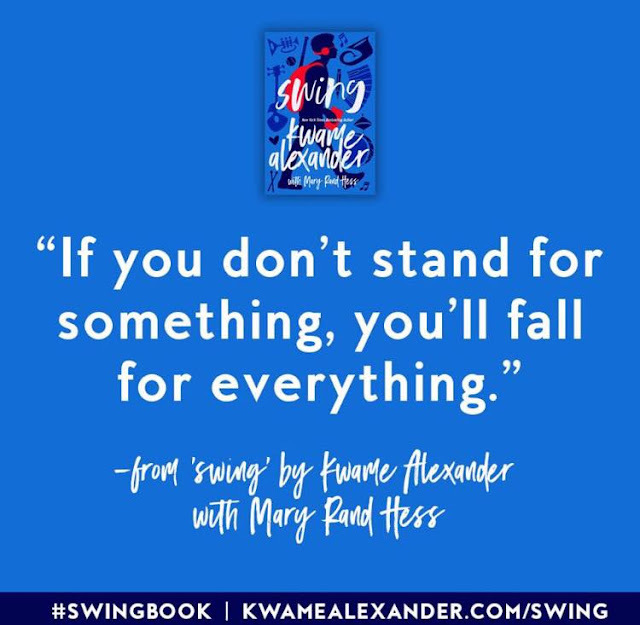 New York Times bestselling authors Kwame Alexander and Mary Rand Hess (Solo) tell a lyrical story that will speak to anyone who’s struggled to find their voice. 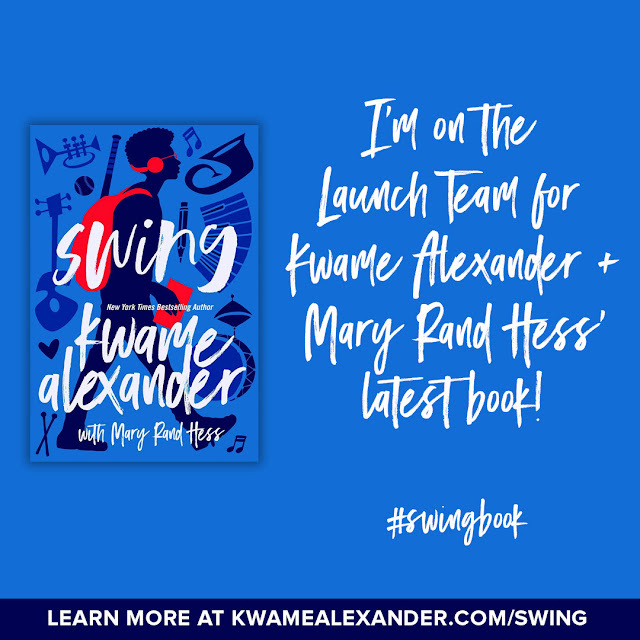 I would like to thank Kwame Alexander, Mary Rand Hess & Netgalley for the opportunity to be on the #SwingLaunchTeam and for the Advanced Reader Copy of the book Swing in exchange of my honest review.